A wildlife photojournalist, author, naturalist and teacher, Mark Wilson connects with wildlife from the Amazon to the Arctic. His children’s book Owling, will be out in March 2019 and will cover all 19 species of owls that nest in North America north of Mexico. 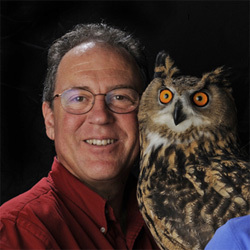 With his wife Marcia, Mark runs Eyes On Owls, and bring live owls to schools, libraries and conservation groups for fun, educational programs. Mark was a former staff photographer at the Boston Globe for 23 years. His photographs have been published widely in newspapers, magazines and books, though he’s perhaps most proud of a bullfrog photo he captured a mile from his childhood home. The frog went on to star on the cover of National Geographic magazine.